Andy Warhol said, "In the future, everyone will be world-famous for 15 minutes." 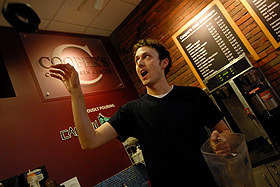 He's probably not going to be world-famous, and he got less than 15 seconds, but our own Paul Rutledge, the tall curly-haired A'viands' employee who makes your lattés and smoothies at Coopers coffee shop, is on the television. Rutledge, a 2009 graduate from Hamline University's theatre program, has worked at Augsburg since the fall of 2010. He's the guitar-playing, jingle-singing, plaid shirt-wearing guy who is sitting in a boat at the beginning of the new Explore Minnesota television advertisement. And yes, he's actually playing the guitar and singing, though he says it's not his guitar you hear in the soundtrack. Rutledge does some acting in the Twin Cities and received an audition notice for the spot. His favorite part of the advertisement is the actor who says, "Nothing rhymes with capita," but his least favorite part was sitting—or rather hanging—in a boat. "It was a fun shoot, but my neck was really sore by the end," he says. He and the fisherman were sitting parallel to the ground in a boat that was up on its end. If you want to see Rutledge on the stage, he'll be appearing in May at the Southern Theatre in "Come Hell and High Water" with The Moving Company, an ensemble led by Dominique Serrand and Steve Epp of the former Theatre de la Jeune Lune. Later this summer, Rutledge will play Horatio in the Jungle Theatre's "Hamlet," directed by Bain Boehlke. Congratulations, Paul! You looked great in your 15 (or 5) seconds of fame.